You can find detailed tips about how to take good photos at home that can be safely converted into valid Visa or Passport photos on this page. 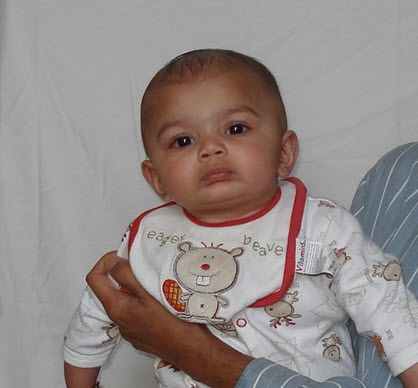 However it is very difficult when you need passport or visa photos for a baby or an infant. We can help you. You take a photo of your baby, provide us your photo and will provide you 6 nice looking photos for $7. We fix background, shadows, exposure in your photos as shown above. Compare above photo with the photo below which is created by free photo websites or other online passport photo sites. Where can I get "Passport Photos for a baby or an infant"? When applying for a passport or visa, you need passport photos and getting them for a baby or an infant is usually a challenge for most parents. Most infants are not able to hold their head until they are old enough. Also they have their on schedule for napping and they can fall sleep at unexpected time. See below for some additional tips just for photographing babies for passport or visa photos. (First two tips were found official Passport photo website of US Government: Travel.state.gov). Tip 1: Lay your baby on his or her back on a plain white or off-white sheet. This will ensure your baby's head is supported and provide a plain background for the photo. Make certain there are no shadows on your baby's face, especially if you take a picture from above with the baby lying down. Tip 2: Cover a car seat with a plain white or off-white sheet and take a picture of your child in the car seat. This will also ensure your baby's head is supported. Tip 3: Hold your child as shown below if the child is old enough to keep her head up. Online Passport Photos will crop the photo to make sure the adult is removed in final photos. Please make sure you hold your child as far as possible (without risking the child to fall) and we will try to help you out with rest of the process. 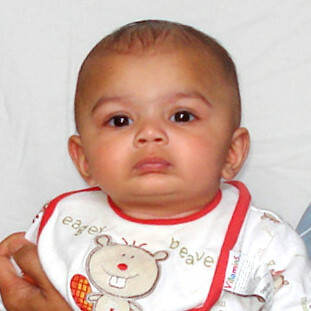 In our experience, most countries are liberal when it comes to passport photos for an infant or a baby. Consulates of India in USA official puts the following relaxation when it comes to passport/visa photos for children. "Babies under one year do not have to have their eyes open. As regards the photograph of the children under ten years of age, requirements can be somewhat relaxed in respect of height of the face, and the position of the eyes in the photographs; and in case of babies and infants also, the position of the face, the facial expression, the eyes and the line of sight can have some relaxation. However, a frontal photograph with clarity is required for children. It should show the child alone (no chair backs, toys or other people visible), looking at the camera with a neutral expression and the mouth closed." Does a baby need a passport? Do I need to take my baby when applying for a US Passport? Yes. You will need to take your baby when you are applying for a passport for her. Where do I get Passport Application form for babies? An application form for Passport is available at most of the Post Offices. You can also download the application form. You can fill up the form but make sure you don't sign it beforehand. The form needs to be signed in presence of Passport officer. What evidence do I need to bring while applying a passport for an infant/baby? * Bring your child's government-issued certified US birth certificate with you. * You and any other parent or guardian who appears must also have valid photo identification, such as a driver's license or current US or foreign passport. * You'll also need two regulation passport photos of your baby.